iLoveToCreate Blog: Showing off her inner rocker and love for Adam Lambert! 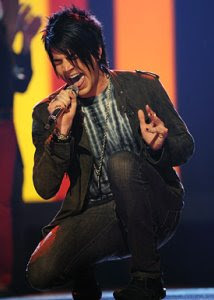 Showing off her inner rocker and love for Adam Lambert! 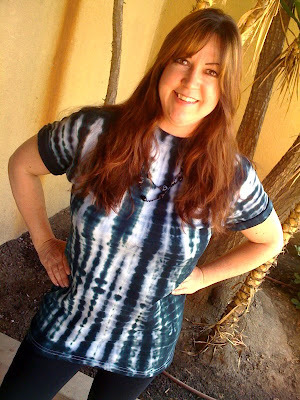 Debbie, a member of our research and development department, totally rocks out in this awesome tie dye tee! When I asked her if she made it she said, "I saw Adam Lambert wearing one just like this on Idol and I wanted to recreate it!" See his version below! Looks like by using a few simple tie dye techniques, Debbie totally nailed the look! If you haven't noticed it already, American Idol is a hot spot for fashion trends. It seems all the contestants like to make bold statements on their jeans or by wearing tie dye creations! And it is really easy to recreate these looks just like Debbie did using Tulip products! All you need to get this particular look is a plain tee (you can get it at a craft store most times for around $3-$4 bucks, sometimes even 2 for $5! ), and our Tulip® One-Step Fashion Dyes™. Regardless if Adam or Chris wins tonight (Debbie is crossing her fingers it is Adam) on American Idol, you can get a rockin' look anytime with our Tulip products just like Debbie did! Love it! You should sell it on ebay! !